Senior citizens in a residential home who meditate are healthier, have better brain functioning and live longer, according to a small study published in 1989 in the Journal of Personality and Social Psychology. Two twenty-minute meditation sessions a day were enough. Two of the researchers were associated with the Maharishi International University, part of the TM-empire built up by Maharishi Mahesh Yogi. This multinational operation sells and promotes Transcendental Meditation training. Transcendental meditation is a stripped-down version of an ancient Asian tradition of mental training, in which practitioners repeat a series of sounds [a mantra] to themselves until they no longer hear what they are chanting. They achieve a state in which their consciousness is empty. This frees the consciousness from daily distractions and elevates it to a higher level, so the supporters of transcendental meditation would have you believe. TM makes people healthier, more alert and increases their feeling of well being. The researchers recruited seventy test subjects in homes for the elderly, who were willing to meditate forty minutes every day (twenty minutes in the morning and twenty minutes in the evening) for a period of three years. Their average age was 81. 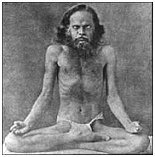 Twenty subjects meditated, twenty did psychological exercises designed to make their brains more flexible [mindfulness training], twenty did relaxation exercises and eleven did nothing [no treatment, NT]. The table below shows that transcendental mediation reduced the old people's blood pressure and improved their mental health. Transcendental meditation [TM] also extends lifespan, the figures suggest. During the three years that the experiment lasted not a single test subject in the TM group died. Mindfulness training [MF] also protected against death, while relaxation [MR] apparently increased the likelihood of dying. It looks that way, but in fact the percentage of people who died in the MR group was no higher than the mortality rate among the residents who did not take part in the experiment [RP], as the figure below shows. The elderly people who meditated felt less old, according to the table below. They were able to solve problems more easily and were more patient in their dealings with others. The researchers did of course have a vested interested in the publication of the article. The TM empire lines its coffers by selling TM programmes and wants to keep things that way. Ten years ago the TM movement raised the costs of their training to 2400 euros for a course. Nevertheless, the idea that meditation – a technique you can learn from a book or internet, or from a yoga teacher - can help you live longer isn't so strange. If you can develop strength just by thinking about training, or spontaneously lose weight if someone tells you how healthy your lifestyle is, [livescience.com 07 February 2007] you must be able to live longer by meditating. You would think. J Pers Soc Psychol. 1989 Dec;57(6):950-64. Meditation boosts the activity of the enzyme telomerase in the cells. A re-analysis of two studies on the health effects of meditation among people over 55. Stress causes the telomeres to shorten faster than normal. But if you do a meditative yoga practice for 12 minutes every day, you make the telomeres longer again.